Their relationship hit a turning point when their first daughter, Sophia, was born in 1996 with a serious heart defect, requiring immediate surgery to save her life. 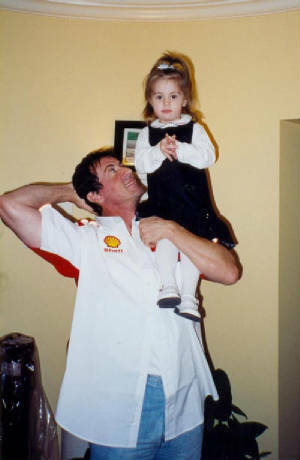 He tells American magazine the Star, "That really made us the parents we are today." "She showed extraordinary strength. In the hospital, she literally shook for three days. I've never seen that kind of love or dedication or the foreboding sense of loss, if things had gone wrong. I feel as though, after nine years of ups and downs, I've really seen the gold she's made out of".Since then, they've had two more girls - Sistine, seven, and Scarlet, three. Jennifer says her husband loves and supports her. She says, "He's phenomenal. I mean he's dropping the kids off at school, picking them up. He's a wonderful father. I think he enjoys it and the girls don't have a problem with me leaving them because they get so much attention from their daddy." "We are not shy about saying we love you to each other because we are an incredibly close family." : "I was an unfocused child and I think a lot of that had to do with not communicating with my parents. I am determined in my house to always talk things through with the girls. "Dinner time is great for that and, as a family, we sit down every night for our evening meal. I want the girls to feel like they can talk to their mum and dad about anything. 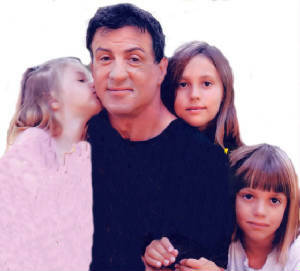 However, Sly dreads his girls turning out like some celebrity offspring. 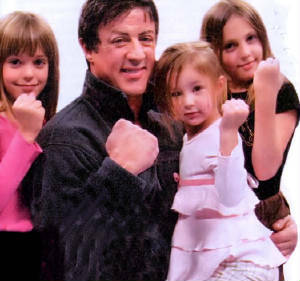 "We spend a lot of time going through the magazines they like as I’m very aware what a celebrity-obsessed culture they’re growing up in," says Sly. "I explain why I don’t want them to lead that kind of lifestyle. I would hate my girls to turn out like that." The actor admits he is "more in love than ever" with Jennifer, they are both eager to add another offspring to their brood. 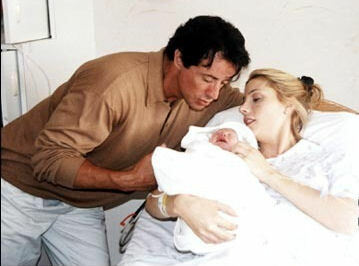 Stallone adds, "Expect an announcement any day now!"